So, every week, I try to cook up something new. There’s a couple of reasons for this. One, it keeps me learning, keeps it fresh. I try things that I’ve never done before, things that I think that some people haven’t done in a dutch oven before. I like to push the envelope. Also, I like to have something to blog about. I mean, would you kind folks keep comin’ back week after week if all I did was chicken and potatoes and dump cakes (both of which I love, BTW). But this week, I asked my wife what she wanted me to cook. Still, I did see it as a chance to do the recipe I did last October, and do it right. By that, I mean, to not forget the bacon. I followed the recipe pretty much straight as written back in the archives. The only difference was that I didn’t have any soy sauce, and I actually had some brown sugar. I used thick sliced peppered bacon. And the result? Wow. Just look at the pictures and see. It tasted every bit as good as it looked! So I guess sometimes it’s cool to revisit the recipes and practice them a bit, eh? After several weeks of more strange and exotic recipes (someone on the dutch oven cooking yahoogroup said, “Mark’ll try anything!” – which I took as a compliment), I did decide to do something more traditionally dutch oven. I was going through my new cookbooks and found a recipe for Shepherd’s Pie. I looked it over, and was intrigued, so I tried it, and made it my own, of course, with a few mods. This recipe is in a couple of steps. It’s not difficult, but there are a lot of things to do to get it done. I started with a lot of coals, maybe 20 or so, underneath each of two 12” dutch ovens. In one were the potatoes, peeled and cubed. In the other was the ground beef, browning. Actually, I ended up putting more coals on top of the potatoes as well. You want to get it good and boiling. Once those both were done, I brought them both inside (it was cold out) and I drained the potatoes. I added the milk, the butter and the salt and pepper, and mashed them all up with a whisk. Then I put them in the fridge with the meat, cleaned up the ovens, and went to church. After church, I came back and put the meat in one of the 12” dutch ovens, and added everything else in the third ingredient set. The original recipe instructions called for sautéing the onions, garlic, mushrooms and carrots first, then adding the meat and broth, but by this time, I’d already taken a lot of steps to cook this and I wanted to simplify. So, I just dumped it all in and mixed it up. Then, I spread the potatoes on top. I had actually not used this many potatoes, and in a 12” dutch oven, I couldn’t completely cover the meat, so that’s why the recipe above has more. The book suggested dragging a fork through the potatoes to make a pattern, and I thought that was a pretty cool idea, so I did it. Then, I put it on the coals to make about 350 degrees. Normally that’s about 8-9 below, and 16-18 above. I ended up with about 12 below and about 22 above because it’s winter. I left that on for about 40 minutes. Also, in an attempt to brown the top of the potatoes, after that I put all the coals on top and let it cook for about another 20 minutes more. It didn’t really brown up much. But then, it’s a wet dish in a dutch oven, so it’s not so likely to brown anyway. But it did taste delicious! I loved the herbal flavor. Then, to make it a truly international feast, a mexican friend of mine heated up some corn tortillas. That was just the thing! I got a whole bunch of (well, four) cookbooks for Christmas. Most of them were the big, hefty 500+ pagers, with all kinds of recipes in them. One was a really cool book all about breads. I’d really like to get good at dutch oven breads this year. Call it a resolution. But, I thought that I’d make something from one of them this week. I looked in the pantry and the freezer to see what we have, and saw some salmon filets in the freezer. So, I started looking for ways to “do salmon”. I found a bunch of recipes for various marinades and sauces, and they all sounded good. Then I stumbled across one called “Coulibiac”. I’d never heard of it. I didn’t even know how to pronounce it (it’s: “koo-lee-BYAHK”. I Googled it!). 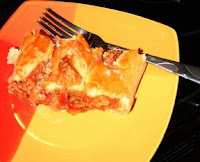 But the thought of salmon and rice and tomatoes all in a pastry shell got me really excited! It was a totally new way (for me) to look at fish. In the Coulibiac, the fish is a part of the dish, as flavor and texture, rather than the whole center of the dish itself. I did it in two days. I’m really glad I did, because I ran into some real troubles in the pastry. The recipe calls for “puff pastry” as the shell. I didn’t know what that was, so I looked it up in the back of the book. It directed me to a recipe for what it called “puff pastry”. That was something you used to make cream puffs and éclairs. I made a batch of it, and was really frustrated when it ended up as a batter, not as a crust. I tried again, thinking I had misinterpreted and mismeasured. Not so. Now I had two bowls of goop that were both clearly unusable for what I was trying. So, I dove into the book. I looked up every possible variation of “puff pastry” I could think of. Finally, I just looked up pies, and there was an aside about all kinds of different pie crusts, one of which, you guessed it, was called “puff pastry”! So, I made a couple of batches of that, and chilled it overnight. Then, today, after church, I rolled out the pastry, added the filling and baked it. But that will all come out in the recipe’s instructions. Also, I made a double batch of the filling, thinking I would make two Coulibiacs (is that proper to pluralize that way?). It turns out that the basic recipe already makes enough for two, so the recipe below is plenty. But, I had to double the crust recipe. Actually, I mixed it and rolled it out twice. Also, I combined some of the steps to make it easier to cook in the dutch oven. Even with that, though, it ended up looking and tasting quite gourmet. And when you bring it out to the table and pronounce it correctly, you’re sure to impress! It will serve a lot of people, because it’s very filling. So, I started by heating up come coals, and adding all the ingredients to a 12” dutch oven. I assembled it in layers, but it all ends up being mixed together. The salmon, after it’s cooked, will break up in the stirring. I put the rice and the broth in first, then the onions and the butter. I used butter slices so that it would melt and blend better, rather than a big butter spot in the middle. I layered the salmon (it was frozen) on top of that, and put the spices and the lemon juice on last. Once that was on the coals, it only took about a half hour to 40 minutes to cook. The salmon cooks fast, but the rice takes a little longer. It also takes some time to get the dutch oven up to temperature, especially on a cold January day. While that was cooking, I started on the crust. Here’s where I had my frustrating misadventures with the éclair batter. As I mentioned, I ended up making two batches of this recipe, for two (side-by-side) coulibiacs. I combined all the ingredients in a bowl and mixed them with a pastry knife. Then, I put it on my floured counter and rolled it out. It was still pretty sticky at that point. I rolled it not so wide, and more long. Then, I folded it bottom up and top down, in thirds. I sprinkled more flour on the countertop and rolled it out again. I repeated this several times, turning the dough each time. Finally, after three or four folding/rollings, I put each batch of dough on a plate, wrapped it in plastic and popped it in the fridge. By that time, the salmon mix should be done for you. I pulled it out of the dutch oven and put it in a big mixing bowl. Since there’s tomatoes in the recipe, I didn’t want to leave it in the dutch oven and ruin my seasoning patina. Then I covered the bowl up and put it in the fridge. In winter, we have a really big fridge that doubles in the summer as a garage. So, today, all I had to do was come home from church and roll out the dough. The recipe says to roll it into a square, about 11”x16”. I didn’t measure, but I shot for that size. Then I put a lot of the filling in the middle. I cracked open a couple of eggs. I rolled the filling up, burrito-style, sealing the seams with the beat up egg along the way. The recipe suggested cutting a few strips of crust dough off before you roll it up to use as decoration, either twisted or braided. I decided to go for the extra style points and try that. It really made it look cooler. Traditionally, you’re also supposed to cut some stylish holes in it, much like you do in an apple pie. I did that for both coulibiacs, and put them side-by-side (kinda crowded) into my 12” dutch oven. With both of them in the oven, I coated them each in more beaten egg. I put that oven onto the coals and baked it for about an hour. That’s longer than the recipe called for, but it’s an indoor recipe, and you’re not dealing with cold weather and heating up the cast iron. I turned the dutch oven a lot, about every 15-20 minutes, to make sure that it didn’t burn on the bottom. When it was all hot and the crust was a rich brown, I pulled it off. It was done! Nonetheless, this one was a delicious treat, and quite the impressive visual as well. Kinda swanky for a back-porch kitchen, eh? On a side note, not about dutch ovening… A client of mine at my day job, over the holidays sent me some steelhead trout that he’d smoked. I’ve never tried it before, but all I could think when I tried it was “WOW”! So, much thanks to Mike and Debbie! When their website is up and running, I’ll make a linkback to them.